Immunotherapy—using the body’s own immune defenses to fight cancer—has already shown significant promise. Now, the latest research says new immunotherapy drugs could dramatically increase survival rates for difficult-to-treat cancers like deadly melanomas, and may be effective in dozens of other cancers including those driven by viruses. This news comes as Vice President Joe Biden’s nationwide “moonshot” initiative to beat cancer is gaining momentum, and spurring more private funding for research. A look at promising developments in the treatment of cancer using immunotherapy. MS. DIANE REHMAnd welcome back. Exciting developments in immunotherapy for cancer treatment are providing new hope to patients with a variety of deadly cancers. New therapies that harness the power of the body's immune defenses have the potential to significantly extend lives. MS. DIANE REHMDr. Ron DePinho is president of the University of Texas MD Anderson Cancer Center. He calls the latest drugs part of the most important advance in cancer treatment in a generation. He joins us from Houston along with Dr. Louis Weiner. He's director of the Georgetown Lombardi Comprehensive Cancer Center and throughout the rest of this hour we will be taking your questions, comments. Join us on 800-433-8850. Send us your email to drshow@wamu.org. Follow us on Facebook or Twitter. And Dr. Weiner, Dr. DePinho, thank you so much for joining us. DR. LOUIS WEINERGood morning, Diane. It's a pleasure to be here. REHMThank you so much. Dr. DePinho. DR. RON DEPINHOGood morning, Diane. Hello, Lou. REHM(laugh) Dr. Weiner, for those who may not be familiar with the term immunotherapy, tell us exactly what it is. WEINERSo typical cancer therapies are designed to specifically attack cancer cells through the use of radiation, chemotherapy, or remove the cancers through surgery. Immunotherapy is different. The best way to describe it is to think of it as treating the body's immune system, so that the immune system can treat the cancer. REHMAnd how does that happen? REHMBut you've got to trigger it on. WEINER...so they can go ahead and attack and destroy the cancer. REHMDr. DePinho, tell us about how this latest research is informing you and other doctors working in this area. DEPINHOWell, this is clearly a major advance for cancer. This is a great example of how scientific knowledge has been converted into a new preventive or treatment strategy that has had a profound impact on a number of different cancers. What's remarkable is that these drugs essentially deactivate -- take the brakes off the immune system, reawakens the immune system. And what we're seeing is very significant clinical results -- in some cases Lazarus results -- were patients with advanced cancers of the lung, skin, kidney, bladder, head and neck, across a broad front. And what this teaches us is that, if we can activate the immune system, the immune system is then very well designed to recognize the cancer as foreign and attack it. DEPINHOThe great challenge right now is to figure out why some patients are having significant responses and others are not responding as robustly. REHMDoes it seem to depend on the type of cancer, Dr. DePinho? DEPINHOI think it's a combination. There are certainly things that go awry within the cancer cell that inform or suppress the immune system. But you can think of the immune system as an orchestra where you have many different instruments coming together to keep the immune system in a highly regulated state. If you have under-activity of the immune system and you have the immune suppression, you can get infections and cancer. But if it's hyperactive, you can develop autoimmunity and a variety of other problems. So the immune system has been designed to be regulated by a lot of brakes and gas pedals that work together in many different types of immune cells, work in an orchestrated way to maintain that balance. DEPINHOWhat the tumor does is that, in the tumor micro-environment, it creates this suppressive environment where it teaches the immune system to maintain a suppressed state and not attack the cancer cell. And what this whole new class of drugs do is to attack the braking mechanism on the killer T-cells, the cells that attack the cancer. And this then unleashes the power of the T-cells on those cancers. REHMDr. Weiner, give us a sense of how this life-changing immunotherapy can have an impact, say, on patients suffering from melanoma. WEINERSo treatment of people with melanoma has historically been very challenging when the cancer has spread to other parts of the body. There were clinical trials conducted a few years ago in which it was shown that these checkpoint antibodies, as they're called, when used alone, might benefit between 15 and maybe 30 percent of people who were treated. And it was reported at a big scientific meeting that we were all at just this -- just earlier this week that the people who were treated with these antibodies, about 30 percent of them were alive five years later. And this was a group of people where you might have expected average survival of perhaps seven months. WEINEREven more astonishingly, combining checkpoint antibodies together -- including one developed by Dr. James Allison, who is one of the pioneers of this field and is currently at Ron's institution, MD Anderson -- when combining that with one of these other checkpoint antibodies, it turns out that roughly 60 percent of the patients undergo very major improvements. And those improvements appear as if they're going to be durable, lasting many, many years. So this is a game changer. REHM...how important is it that cancers driven by viruses are responding to this type of treatment? REHMGive me a sense of a type of cancer that is induced virally. WEINERSo some head and neck cancers can be induced by the human papillomavirus. And so those types of cancers appear to be very sensitive to immunotherapy strategies, but so do cancers that are originating in the head and neck that do not emanate from a viral infection. So I think the jury is still out as to how important viral infections are going to be. But what is important is that so many different malignancies seem to have at least some level of sensitivity to checkpoint antibodies, as they're called, alone or in combination. REHMDr. DePinho, how many people are currently or have been in the past treated or indeed cured with immunotherapy? DEPINHOWell, it's in the tens of thousands at this point that have been enlisted on clinical trials. And now that this is standard of care, that number is going to accelerate rather significantly. Just at MD Anderson alone, in our cancer Moonshot initiative in the last year or so, we've launched about 100 immunotherapy trials and have put about 6,000 patients on those trials. So this is clearly going to be one of the bedrock treatment strategies for cancer. DEPINHOAnd now the, you know, question becomes, how do we combine it? As Lou was mentioning earlier, the combination of two checkpoint inhibitors to -- that attack those braking mechanisms are having additive results for patients. And so now what we're doing is we're building on that success and we're trying to bring it up higher and higher so that an increasing number of patients and different types of cancers can be eradicated. DEPINHONow, in the very first therapies for melanoma, 22 percent of patients are now alive more than 10 years out. And to put that in historical perspective, for patients with advanced disease, only a very, very small fraction are alive years later. Typically they die within six to nine months. The addition of the second drug has -- now shows that the majority of patients are having durable responses. We can't yet say cure, but these are many years out where patients are having -- are free of disease. DEPINHO...vaccines in the '50s. And now this latest advance, I think, is going to go down as one of the great victories of basic science being converted into transformative therapies. REHMDr. Weiner, I'm thinking of two cancers in particular -- breast cancer, lung cancer. Have -- has immunotherapy made any advances there? WEINERIt has. One of the most exciting things about this revolution that we're experiencing is that it's not limited to just a handful of malignancies. There's a -- there are different molecular types of breast cancer. One of them, a particularly aggressive form, is known as so-called triple-negative breast cancer, which is very difficult to treat. And it's been found that immunotherapy targeting triple-negative breast cancer patients can be effective in some patients. And we're trying to now discern why it is that some of them benefit and others do not. WEINERAnd that's very important and exciting work. And in the setting of lung cancer, which is the most common cause of cancer death, it's also been demonstrated that some patients with lung cancer also benefit from targeted therapies using these checkpoint antibodies. REHMSo it sounds as though it becomes very individually designed. WEINERWell, it can be individually designed. But it's probably going to work best by us learning who is likely to benefit based upon an analysis of the patient's tumor. What are the immune checkpoints that are actually in play? How do we define which ones they are? And what are the escape routes that these cancers might utilize in order to avoid destruction? And when we can understand that better, I think we can move forward and do an even better job of treating these patients. And this is why we have to have a continued investment in the basic science, in order to understand how to leverage new discoveries into clinical action that saves lives. REHMAnd the vice president's Moon Shot for cancer. What do you think about that? WEINERI think that any attention that's paid on the most devastating set of diseases that affects humans is a great idea. And the more attention that is paid and the more resources that are applied to addressing this devastating problem is something that I'm really excited about. REHMDr. Louis Weiner is director of the Georgetown Lombardi Comprehensive Cancer Center. And you're listening to "The Diane Rehm Show." And joining us now from Jacksonville, Fla., Britta Fortson. She's an immunotherapy patient who suffers from ocular melanoma. Hello, Britta. Thanks for joining us. MS. BRITTA FORTSONThank you, Diane. It's a pleasure speaking with you. My family and I are big fans. REHMThank you. Britta, tell us about your particular type of cancer and how you found immunotherapy. REHMYou caught it. What do you mean, you caught it? FORTSONBecause of the diligence of my primary care physician, I had -- I went and got a liver ultrasound and they found tumors that had metastasized to my liver 23 years later after my original tumor. REHMSo you turned to immunotherapy and that was what your doctor recommended? FORTSONWell, I went and had a local opinion here in Jacksonville, Fla., and my doctor actually -- the doctor I had met with in Jacksonville suggested I have a second opinion. And he actually suggested I go to MD Anderson. Because the cancer I have is so rare, there are only a few doctors in the world that specialize in this type of cancer and one practices at MD Anderson. Her name is Dr. Sapna Patel. REHMAnd I gather, at first, your own doctor wanted to do radiation. Is that correct? FORTSONThat's correct. One of the suggestions was to have radiation, where they inject radioactive beads into your liver and the radiation attacks the cancer. But the chances of the cancer continuing to come back is very, very likely. So immunotherapy is a systemic approach, so the cancer is attacked by the -- like, the doctors have been talking about, it's on immune -- your own immune system. And so it's more successful if it will work. REHMSo if you had had radiation therapy, I gather that would have affected your quality of life rather significantly. FORTSON...it was actually very scary for me to research. They researched for me and they found a lot of information on Dr. Patel. And I flew out to MD Anderson and we tried immunotherapy. REHMAll right. We'll take a short break here and, when we come back, we'll take some calls. Your interest, I'm sure, is high. Stay with us. REHMAnd welcome back. If you've just joined us, here in the studio, Dr. Louis Weiner. He's Director of the Georgetown Lombardi Comprehensive Cancer Center. And joining us from Texas is Dr. Ron DePinho. He's President of the University of Texas MD Anderson Cancer Center. Also on the line with us is Britta Fortson. She's an immunotherapy patient who suffers from ocular melanoma and is being treated with immunotherapy. I'm going to open the phones. 800-433-8850. Let's go first to Henry in Arlington, Virginia. You're on the air. HENRYThank you for your show. I actually benefitted from a previous show of yours where you talked about bladder cancer. And you featured Dr. Mark Schoenberg and I came under his care as a result of, partly, as a result of that show. And thank God, because he actually was able, when he left John Hopkins, he was, I think, released from all sorts of rules, I suspect. I don't know this, but he gave me a referral that I don't think I otherwise might get to a doctor Lamm in Phoenix. HENRYAnd after going through every possible treatment for bladder cancer, I ended up getting the kind of treatment that your two guests are explaining. I found out last week, after six months of work with it, it worked. REHMOh Henry, I'm so glad for you. That's really just great news, and I'm glad you were listening to that program. But it leads me to ask you, Dr. DePinho, what about bladder cancer? Is immunotherapy at work there? DEPINHOYes. There's no question that this is also impacting on bladder cancer. There's quite a significant fraction of patients that are having rather, you know, robust, complete responses in that disease. Bladder cancer is often caused by tobacco use. It's one of the major instigators of bladder cancer. Tobacco creates a lot of mutations in the cancer cell and that makes it a lot more aneugenic so that the immune system would have opportunities to recognize it as different, as foreign. REHMInteresting. All right, let's go to Natalie in Houston, Texas. You're on the air. NATALIEHi Diane. Thank you for taking my call. NATALIEIt's actually been on my bucket list to call and comment before I turn 30 later this year. I -- my dad is currently being treated for stage 4 esophageal cancer here in Houston and earlier this year was briefly treated with an immunotherapy trial. My question for your panelists is so much of the research leads us to believe that we can prevent cancer, but it would be through recognizing what genes and, like, what genetics control cancer. And do they think that this immunotherapy will just be a part of our research to eventually be able to prevent these terrible diseases that affect us all? DEPINHOThis -- the person, the call in person brings up a really important point. We've been talking a lot about the treatment of advanced disease, but there are remarkable opportunities to harness the power of the immune system up front. One of the most celebrated examples is the HPV vaccine, where the vaccine is teaching the immune system to recognize the HPV virus. It's a safe and effective vaccine that has the potential to eliminate tens of thousands of cancers in the United States alone and hundreds of thousands throughout the world. That's a great example of how the immune system could be harnessed to attack viruses that cause cancer. DEPINHOIn addition, we have also for diseases that have been treated like HER2 breast cancer, a certain form of breast cancer, Elizabeth Mittendorf here, at MD Anderson, developed a HER2 vaccine. About a quarter of patients will recur with the disease and ultimately succumb to the disease after standard treatment with Herceptin. This safe and effective vaccine, HER2 vaccine, appears to eliminate the recurrence of the disease in the vast majority of those patients that would otherwise recur. So those are some examples, other than a treatment of advanced disease, how we can harness the power of the immune system, both at the front end and at the back end of treatment. HENRYNatalie also mentioned esophageal cancer. Tell me about immunotherapy there. WEINERSo, esophageal cancer is another one of the diseases that is potentially sensitive to immunotherapy. Again, we don't know all the reasons why some people respond and other people don't. And it's important to recognize also that not only do the checkpoint antibodies work, but as Ron pointed out, vaccines might be useful. We and others have been studying the use of cancer vaccines for many years, not only in the preventive setting, such as HPV, but also in the what might be termed the secondary prevention setting, where somebody's had a cancer removed and you're trying to actually prevent the cancer from coming back. WEINERSuch as the example that was cited. WEINEROn top of that, there is a whole other generation of immunotherapies being developed that are really very exciting, that don't try and release the brakes, but actually step on the accelerator in new ways. Such as the use of so-called CAR T-cells, Chimeric Antigen Receptor T cells that are specifically designed to be able to target the cancer cells quite specifically and they're essentially created in the laboratory from people's own blood cells or that of others. They're infused into the patients and there have been utterly remarkable responses seen in people with leukemias and lymphomas. So there's many different ways we can harness the power of the immune system to attack cancer. REHMIndeed. And here's a tweet from George. We've had lots of questions about cost. George says he's very thrilled to hear about all these cutting edge medical advances tempered by what these treatments cost. WEINERYes. These are expensive therapies. However, I think it's important to recognize that the expense of the therapy has to be compared to the effectiveness and the duration of effectiveness of the treatment and what the impact is on somebody's life. REHMBut is insurance covering these kinds of treatments? WEINERIncreasingly, insurance is covering these treatments. REHM...one -- one would not want a whole sector of society to be excluded from those treatments because they cannot afford them. WEINERI agree completely. It's been my experience that when there are good data to support the use of a particular immunotherapy treatment for patients with cancer, that insurance companies have, by and large, stepped up to the plate. REHMBritta Fortson, can you talk about cost in your own case? FORTSONAbsolutely. It's very expensive the way I am getting my treatment because I travel back and forth to Houston from Jacksonville to get treatment every two weeks. FORTSONSo that's my own expense, but the immunotherapy drugs are covered because I am in a clinical trial. So that's key, and the things that they learn about these cancers in the clinical trial will eventually help other people. So that means a lot to me as well. MR. BEN GINSBERGBut if you were not in a clinical trial, Dr. DePinho, what would happen? DEPINHOWell, you know, this is a very important issue for our patients. There's no question that many patients now that they're having to take on more of the risk and the payments are really suffering economically. This is a huge hit. We have a lot of programs that help support our patients, but we need fundamental structural changes that involve the ability of the government and CMS to do price negotiations. We also need to address the root causes of why they're so expensive in the first place. DEPINHOIt turns out that 19 out of 20 drugs that are entering into clinical trials will fail. And so, we need to do a much better job in bringing the best possible agents to the doorstep of clinical trials, because the expense comes from paying for a lot of the failed clinical trials as well as that one in 20 success. So we need to insure that we maintain investments from the private sector in the development of new drugs while at the same time, academia could play a formidable role in helping reduce the rate of failure by improving scientific knowledge. DEPINHOAnd at MD Anderson and our Cancer Moon Shots Initiative, we have a platform for science driven drug discovery that's intended to increase the rate of success of those agents that are going into clinical trial. So it's a complex subject. It's going to require multiple different solutions. REHMWe have a comment on our website from Trish. Has this treatment been successful in patients with ovarian cancer? Dr. Weiner. WEINERI don't think that ovarian cancer has yet had the same level of success, but this is why we have to do clinical trials. And I want to echo something that Ron mentioned. 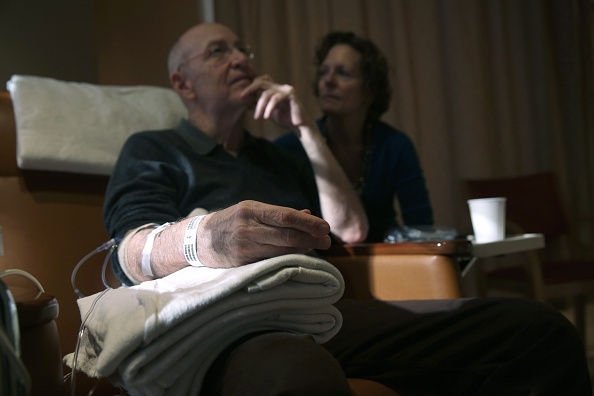 Only three percent of adult Americans with cancer go on clinical trials. And just as MD Anderson has an extraordinarily robust clinical trials program, Lombardi Cancer Center through its Med Star Georgetown Cancer Network, which I oversee, is responsible for bringing to the public as many exciting new clinical trial opportunities as possible. And I think it's incumbent upon all cancer providers to endeavor to get their patients to participate in clinical trials when it's appropriate so that we can make a difference. REHMAnd a number of people are asking about side effects. Indeed, someone called saying my sister died after 10 years of misery from the side effects of treatment for breast cancer. Loss of feeling in her lower body and face from neuropathy, loss of teeth from gingivitis, short angle glaucoma. Effectively, her body underwent a medically induced aging process such as that of a 59-year-old woman. Her body was that of an 80-year-old person. Britta, I wonder about you and side effects. FORTSONI am not without side effects. It's not as hard on the body as chemotherapy at all. But I do suffer from dry mouth, joint inflammation, lung inflammation. I have some stomach issues. I have gained weight, I lose weight. Fatigue, some hormonal issues. But I am also a 43-year-old woman, so I don't know how much of that is just being a 43-year-old woman. And, you know, there are days where I feel like I have been out partying all night long and I have a horrible hangover. FORTSONAnd of course, that's not the case. So, I do have some side effects, but if I -- I feel like if I communicate them to my doctor and they can get control of them, the medication, you know, sometimes they just teach me some techniques to get past some of these side effects. I feel like I have better success with my treatment. REHMAnd you're listening to "The Diane Rehm Show." Dr. Weiner, does what she describes sound familiar? WEINERYes it does. The caller, who described the side effects that her sister had faced, was describing what are potential complications of conventional chemotherapy strategies. WEINERImmunotherapy causes a different complex of side effects. Some of the antibodies that are used are really very well tolerated and don't cause much problems. Others cause a different panoply of problems. And what's so interesting is because these are activating the body's immune system, we have patients who are experiencing some increase in what we might term autoimmune reactions that need to be managed. So Oncologists now have to learn about a whole new way of managing a different set of complications than they used to. WEINERSo one of the drugs that's been developed, which is called Ipilimumab, targets CTLA-4 which is one of the checkpoints that we were talking about earlier. And it's really been a very important advance in the field, but it does cause a variety of side effects, including diarrhea that can be caused by autoimmune attack. And it can also cause some problems with pituitary gland function. And these need to be monitored very carefully. WEINERBy Oncologists who never had to think about pituitary gland dysfunction when they were giving chemotherapy. REHMAll right, to, finally, St. Louis, Missouri. Sheila, you're on the air. SHEILAFirst, I want to say, Diane, that I would like you to have a school where you could teach as many people as possible how to be like you, how to be courageous, how to have the best show on the planet. SHEILAAnd I'm so grateful to you, because I don't usually call in to any show. I am the Founder of the Adam Mitchell Foundation because my son tragically died at 26 from cancer when he didn't need to die of cancer. He was given misinformation. He was given toxic drugs by the oncologists all over Florida and they told me he could eat toxic foods, drink alcoholic beverages, everything that fed his tumors. So now, I've collected 10 doctors from around the world who have actually given me a formula, a non-toxic formula and it's reversing cancer in my little 14-year-old dog. She's a Maltese. SHEILAAnd I work with Dr. Raymond Francis, who wrote, "Never Be Sick Again, Never Fear Cancer Again." He's educated at MIT. He is helping me. So is this other doctor who had to go to Mexico to have a non-toxic cure for cancer that is legal. In Mexico, but not legal in the United States. There's no negative side effects. REHMOh, Sheila, I'm so sorry. And you know, I have heard it said many times that chemotherapy can either cure you or kill you. And it sounds as though Sheila's son had a very, very experience with that. I'm so sorry. We are out of time. I'm sure there's lots more to be said. We'll be following the growth and development of the uses of immunotherapy. I want to thank you all. Dr. Ron DePinho, Dr. Lou Weiner, and Britta Fortson for joining us. Thank you for giving us all this good information. WEINERThank you. It's been a pleasure.